Actually, there's no need to panic. If the human attention span was really that short, we would never have made it down from the trees. You have to be aware that there are two types of attention span: Focused attention is the amount of time that a human can focus his or her undivided attention on something. This, according to several sources, is indeed at around 8 seconds for the average human these days. For the context of presentations, however, the other type of attention span, called sustained attention, is more important. The average value for that attention span is somewhere close to 20 minutes. While that's good news for short talks, it does of course mean that you need to do something about it for a longer talk, e.g. your typical 60-minute conference presentation. You obviously don't want to lose your audience after only one third of your talk. The trick is that you can "reset" the 20-minute counter for sustained attention by introducing a change in your presentation. Dr. John Medina (who knows a thing or two about our brain) suggests that you do this much earlier than 20 minutes, though. He calls it the 10 minute rule and suggests that after every 10 minutes or so (it's not a strict limit - 12 or even 15 minutes would also be fine), you do something different in your presentation. If you've been showing slides for the last 10 minutes, interrupt and ask the audience to do an exercise. Or switch to drawing on a whiteboard. Or ask a question. Or show a video. And so on - you can surely think of something. The point is to force the audience to switch their mode of operation for the next couple of minutes before you again switch to something else (or back to slides or other things you've done before). Just don't make them sit through the entire presentation just watching you talk. Then you'll surely lose their attention - probably much sooner than 20 minutes! The proverbial short attention span of the goldfish is something that you need to take into account in some situations (more on that some other day), but for most presentations, you only need to keep the sustained attention in mind. If you assume that to be around 10 minutes and plan your presentation accordingly, you won't lose your audience so easily. "Attention Span - Humans vs. 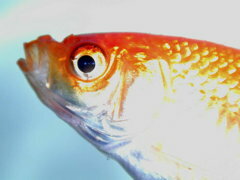 The Goldfish" by Dirk Haun is licensed under a Creative Commons Attribution-ShareAlike 4.0 International Licence.